Computers that can be used outdoors are not usually computer graphics powerhouses. Built to meet Mil-Spec requirements and operations, the MilPAC has been designed specifically for use in simulation, weapons system training, vehicle mount applications and anywhere a powerful graphics workstation might be needed. The MilPAC is integrated with fully sealed Mil-Spec connectors, heavy-duty filters, and waterproof keyboards for the harshest of environments. Dual AC and DC power supply with redundant fail-over allows uninterrupted operations both in vehicles and in command tents. It has also been designed to operate in wide temperature ranges, extending its compatibility to more military applications. Integrated with fully sealed Mil-Spec connectors, heavy-duty filters, and waterproof keyboards, the MilPAC was designed specifically for use in the harshest of environments. 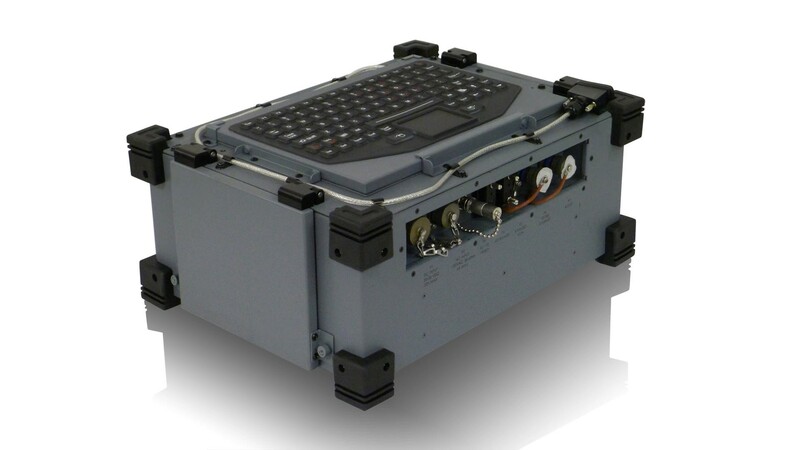 This rugged computer also comes with rubber bumper corners and has dual AC and CD power supply with redundant fail-over to allow for uninterrupted operations both in vehicles and command tents. Finally, the MilPAC meets all MIL-STD-810G requirements. 0°F: Meets MIL-STD-810G, Method 502.5 procedure II. 120°F: Meets MIL-STD-810G, Method 501.5 procedure II. -50ºF: Meets MIL-STD-810G, Method 502.5 procedure I. 160ºF: Meets MIL-STD-810G, Method 501.5 Procedure I. 1.8" per hour blowing at 20mph for 30 minutes per side: Meets MIL-STD-810G Method 506.5 Procedure I. 73 +/- 4 F and 50 +/- 5 percent Relative Humidity RH: Meets MIL-STD-810G Method 507.5. Operational altitude of 15,000ft for 8 hours: Meets MIL-STD-810G Method 500.5 Procedure II. Velocity of 20mph and concentration 10.6 g/m for 6 hours: Meets MIL-STD-810G Method 510.5 Procedure I. 280 l/m2/hr for 30 minutes per side: Meets MIL-STD-810G Method 506.5G Procedure III. Meets MIL-STD-461F RS103, Paragraph 5.20. Meets MIL-STD-461F, CE 102, Paragraph 5.5. Meets MIL-STD-461F CS 101, Paragraph 5.7, CS 114, Paragraph 5.13, CS 115, Paragraph 5.14, CS116, Paragraph 5.15.